Yun-Fei Ji: Ghosts and Men from Badong July 3 through August 29, 2010 Opening reception: July 3, Saturday, 6 - 8 p.m.
James Cohan Gallery Shanghai is pleased to announce the exhibition by Yun-Fei Ji, opening July 3 and running through August 29. This is the first solo "homecoming" exhibition for the artist in mainland China, following his highly acclaimed exhibition at James Cohan Gallery, New York, earlier this year. 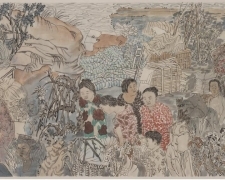 The Shanghai exhibition will include new paintings on paper as well as the artist's recent major print project, a 32-foot long hand scroll, The Three Gorges Dam Migration, published by the Library Council of The Museum of Modern Art, New York. Born in 1963 in Beijing, Ji was separated from his parents at an early age and grew up with his grandparents outside of Hangzhou on a collective farm. There, with the absence of television and radio in the countryside, he was entertained by his grandmother who told him ghost stories and folk tales; his grandfather introduced him to calligraphy. 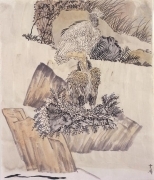 Ji attended the Central Academy of Fine Arts in Beijing, studying traditional painting techniques with a particular interest in Song Dynasty landscape painting. Most of his professors at the time had been trained in the Soviet Union during the 1950s when classical Chinese art was considered neither fashionable nor progressive. However, it was a costume and lighting designer for films who taught Ji that "reading a painting is like reading a poem." This clearly struck a deep and lasting chord for the artist. 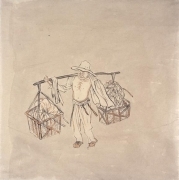 After relocating to the United States in 1986 on a fellowship from Fulbright College at the University of Arkansas, Ji found his direction of reinventing the system of symbolic images and structures found in classical Chinese painting to explore the consequences of industrial development on contemporary life. 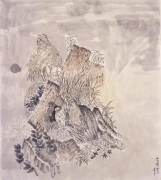 As Ji states, "I use landscape painting to explore the utopian ideals of Chinese history, from exhibitions collectivization to new consumerism." 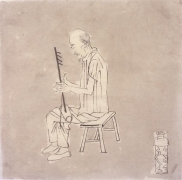 In his new body of work, Ji continues to reference the historical in order to connect with the contemporary while revisiting the folk legends he grew up with and also exploring classical texts such as Strange Tales from a Chinese Studio, a well-known collection of 18th century ghost stories by Pu Songling. 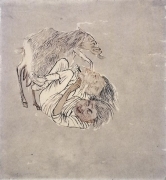 Ji's paintings are populated by animal spirits and monsters, taking his inspiration from these tales to offer a critique on corruption, abuse and greed. The artist has recently taken inspiration from the writings of French libertarian, the Marquis de Sade. Ji draws a parallel between Sade's tales of decadence, where noblemen fall prey to vice and sexual misconduct while expecting the public to be self-sacrificing. Ji sees something of a connection in Sade's literary masterpiece as both a metaphor and foretelling for those in positions of power who have clearly turned against the fundamental principles extolled in Confucius and Taoist philosophy. Also on view in Ji's exhibition is his new artist book The Three Gorges Dam Migration, which is presented in the form of a hand scroll. This work is another representation of the artist's continuing endeavor to portray the social and psychology controversy surrounding the building and subsequent flooding of the Three Gorges region on the Yangtze River. This 32-foot long, gradually unfolding narrative tells the story of the effects of the project on the general population of region. New York Times writer Dorothy Spears suggested that Ji is perhaps less interested in criticizing the world's largest hydroelectric power plant—long a symbol of progress in China— as he is revealing the interconnection between humans and their natural environment. The artist states: "The belief among ancient scholars is that nature offers an ethical model that we should follow in human society. A horizontal line, for example, in Chinese calligraphy, is like a cloud formation, or a natural, living form." The hand scroll consists of hand-printed paper mounted on silk that was made with over 500 hand-carved woodblocks. 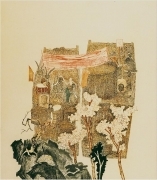 It was printed at the renowned Rongbaozhai studio in Beijing, which was once closely associated with Beijing's Imperial enclave and the Forbidden City. 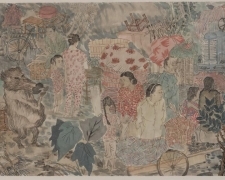 Rongbaozhai still makes prints and scrolls in the style it developed over a thousand years ago and has been declared a 'rare intangible cultural property' by the Chinese government. 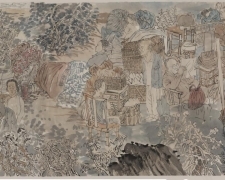 Like Ji's paintings, this scroll is populated with naturalistic and symbolic images of places and people, from 'floating weeds', an ancient Chinese phrase for displaced or homeless people, to imaginary and ghostly creatures. At the end of the scroll, Ji's calligraphy tells the long history of China's ambition to tame the Yangtze. Yun-Fei Ji received the 2006 American Academy Prix de Rome fellowship and residency, and, in 2007, was artist-in-residence at Parasol Unit foundation for contemporary art in London. 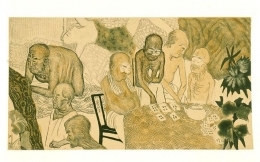 In 2005, Ji was artist-in-residence at Yale University where he conducted extensive research with the institution's scholars. Ji's important solo museum exhibition, The Empty City, 2004, originated at the Contemporary Art Museum (St. Louis, Missouri) and toured to the Rose Art Museum, Brandeis University, Massachusetts, and the Peeler Art Center, De Pauw University, Indiana. 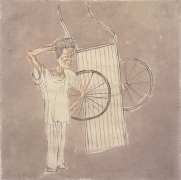 In 2004, the exhibition Yun-Fei Ji: The East Wind was organized at the ICA, University of Pennsylvania. Ji's work has been exhibited in solo and group exhibitions throughout the United States and Europe, including the Whitney Biennial 2002. In 2008, Displacement: The Three Gorges Dam and Contemporary Chinese Art, an exhibition of four Chinese artists originated at the Smart Museum of Art, Chicago, and continues to tour nationally. Yun-Fei Ji lives and works in New York. For Further information, please contact Leo Xu Lxu@jamescohan.com or by telephone +86- 21-54660825 x 602.